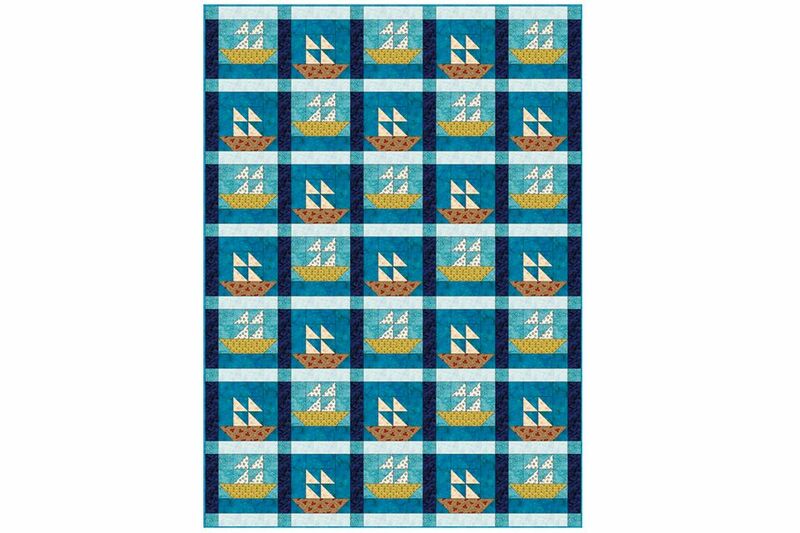 This easy Sailboats quilt pattern is assembled with thirty-five 12-inch patchwork quilt blocks sewn into horizontal rows and separated by sashing and cornerstones. Two different sailboat quilt blocks are alternated with each other side-by-side and row-to-row. The quilt finishes at about 72" x 100". Add or subtract blocks (12" finished) and sashing (2" finished) to alter its size. Each column or row that you add or subtract (block plus sashing) alters the quilt's dimensions by 14". In the quilt illustrated, one block's background is created from a single blue fabric. The same fabric is repeated underneath the boat in the alternate block. A lighter blue is used for the sky in the alternate sailboat blocks, and that fabric is repeated in cornerstones. Boat fabrics are sewn in warm colors that contrast with the cool blues of the sea and sky. Sails are cut from lighter fabrics. Vertical sashing is a deep, midnight blue and horizontal sashing strips are cut from a very pale blue cloth. Batting: About 84" x 112"
Refer to the two sailboats quilt block patterns linked below for assembly instructions. Make a sample of each sailboats quilt block before you cut all of the fabric required for the entire quilt. Cutting instructions assume your fabric has a usable width of at least 42". Gather five light blue sashing bars and six cornerstones. Sew the pieces into a horizontal row as shown, top illustration, beginning and ending with a cornerstone. Match edges carefully. Press seam allowances towards the sashing, taking care not to stretch the row. Make a total of eight sashing/cornerstone rows. Gather six dark blue sashing bars, three blocks with boats sitting on the water and two blocks with boats sitting at the bottom of the block. Sew the blocks into a row as shown, middle illustration, alternating blocks and beginning and ending with sashing bars. Press seam allowances towards the sashing bars. Make three more identical rows. Gather six dark blue sashing bars, two blocks with boats sitting on the water and three blocks with boats sitting at the block's bottom. Sew the components into a row as shown, bottom illustration, alternating blocks and beginning and ending with sashing bars. Press seam allowances towards the sashing bars. Make two more identical rows. Refer to page 1. Sew all rows together, placing sashing/cornerstone rows between rows of blocks and at the top and bottom of the quilt, easing where necessary to match seam allowances. Use straight pins to match seam intersections. Mark the top for quilting if necessary. Sandwich with batting and backing and baste. Quilt the quilt and remove excess batting and backing. Finish by applying the binding.